I thought that I would break up the extreme elements show with this Clean & Simple (CAS) card. This is from Monday's CAS#25 which is a sketch challenge. You can check out the original CAS post HERE! It is always so difficult to get a good photo of a white based card, so I apologize now for the photo. It really doesn't do this card justice. IRL, it's a beautiful, crisp and clean card. So simple to make...under 10 minutes. I started with the Whisper White base. I used my Big Shot and the Backgrounds #1 Texturz plate - Flourish to dry emboss the card front. The panel is Basic Black, with a layer of Whisper White and a strip of Razzleberry Lemonade DSP. Of course, my fav black gingham ribbon! 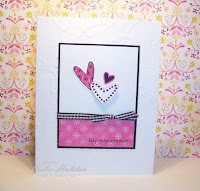 I stamped the hearts from Love You Much in Basic Black and added a bit of Melon Mambo marker for some color. 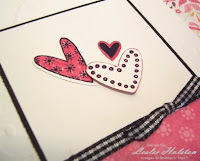 These are punched out using the Heart to Heart punch (on sale this week only for a low $10.99 through Stampin' Up! 's Deal of the Week). These were snailed to the panel with the medium heart up on a dimensional. Thanks for stopping in today. I'll be back tomorrow with another masculine elements card. I hope you've been inspired to give Monday's CAS challenges a try.